In today’s increasingly complex operating and regulatory environment, the expectations around audit and control management are shifting. Compliance and internal audit teams can no longer be reactionary. They must be proactive in identifying and monitoring risk. Faced with expanding scope and demand for efficiency, there’s never been a better time to increase control. Close the gap between control performance and attestation with BlackLine Compliance—an integrated, cloud-based solution for identifying risk and executing control workflows. Both configurable and flexible, and standardized and consistent, BlackLine Compliance is a one-stop shop for maintaining RCMs, managing PBC requests, performing audits such as SOX 302 and 404, and more. With real-time intelligence into your compliance program, you can drive value-adding recommendations and achieve strategic risk initiatives. Unify all compliance documentation, projects, and stakeholders in one globally accessible, cloud-based system to maximize visibility. 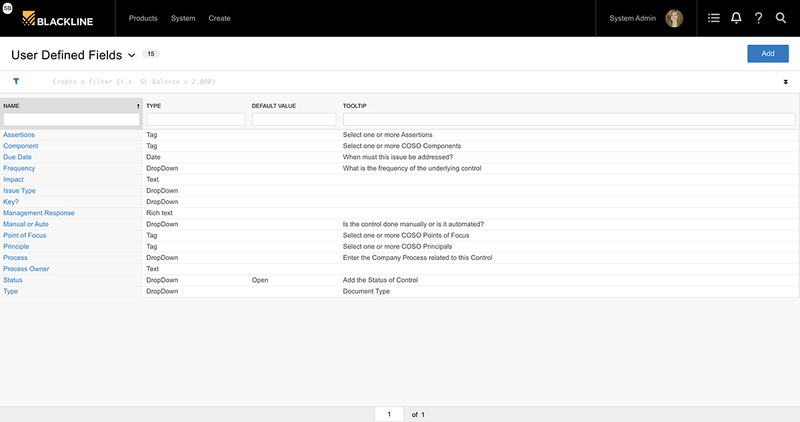 Link controls to related risks, narratives, and projects, and ensure version control across records. Benefit from a central command center to perform control testing, analyze supporting information, and identify issues, all while effectively managing workflows and communicating among teams with ease. Gain a comprehensive view of all your compliance initiatives. BlackLine Compliance supports a wide variety of use cases, including SOX 302 and 404, operational and IT audits, self-assessments, and more. 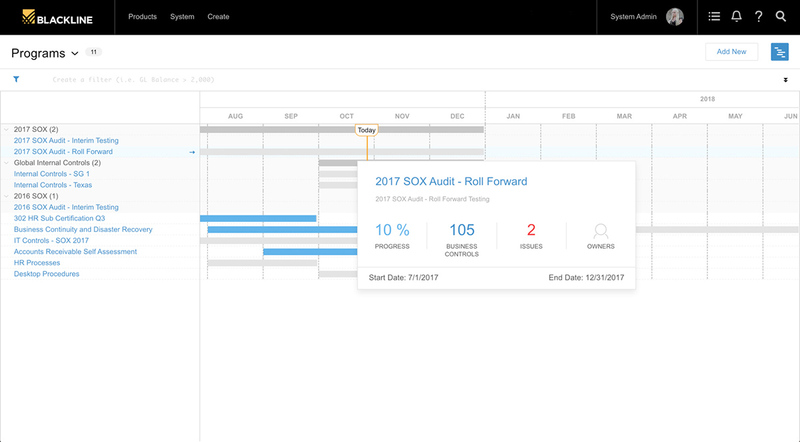 Set the start and end date, and select relevant controls to create an audit project. Assign tasks such as testing, review, and approval to team members, and track progress. Direct linkage to control performance promotes audit efficiency and saves time for valuing-adding activities, like gap analysis, deficiency trending, and process improvements. 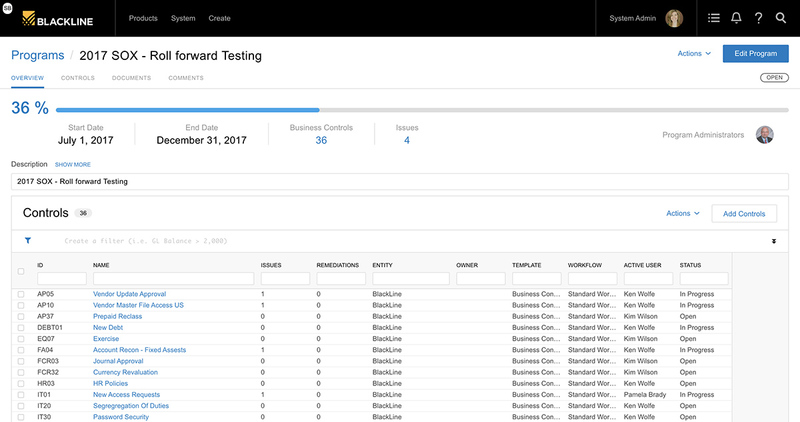 Reduce dependencies and enable compliance and internal audit teams to access underlying reconciliations and other compliance tasks performed in BlackLine. Configure reports and visualizations to give management a high-level view of the addressed risks, performed audits, identified issues, and steps taken for remediation. Then drill down into the details to address specific controls, procedures, and assignments. Ensure that nothing slips through the cracks with immediate visibility into completed work and action items. BlackLine Compliance can incorporate existing control frameworks, RCMs, business procedures, and terminology. With our highly configurable system, there’s no need to reinvent the wheel. Create any field, custom view, and form to meet your unique business needs. In addition, easily build workflows and assign responsibility to team members as your business evolves. and are able to focus on completing our testing and adding more value to the company."